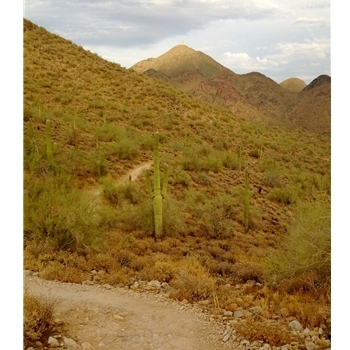 A popular daily hiking loop hike through the scenic McDowell mountains. Trail Description Starting at the Gateway Trailhead, you will begin a gentle elevation gain and connect to the Gateway Loop trail in about 1/2 mile. Taking the Gateway Loop right will lead you to the Bell Pass Trail branch off and taking a left goes to the Windgate Pass Trail. Either way you take, you will reach the Gateway Loop turn-offs in about a mile. The middle mile/portion of this loop is the connection of the Bell and Gateway Pass trails and offers the highest point of elevation on this loop.